Millions of last-minute Christmas shoppers across the UK have been flocking to buy presents and food. Some 130,000 customers were expected at Glasgow's St Enoch centre on Saturday. Bluewater in Kent said 100,000 people passed through its 330 stores. Barclays Bank predicted £2.5bn could be spent on Saturday and £500m withdrawn from cash machines. Some stores have been criticised for planning to let Christmas Eve customers in early despite Sunday restrictions. A spokeswoman for Bluewater said: "There are so many men, hunting in packs or on their own, definitely looking a bit panicked or stressed out. It's hilarious," she said. According to its director Mohammed Dajani, the Meadowhall shopping centre near Sheffield was packed with customers standing "shoulder to shoulder" and was "very, very busy". 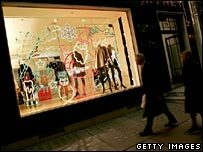 According to BBC correspondent Barnie Choudhury, shopping in the West End of London on Saturday has been quieter than expected, but shops such as Selfridges still expect to record better sales than last Christmas. The Scottish Retail Consortium has predicted "a strong surge" in numbers. Some 130,000 people were expected to pass through the doors of the St Enoch Centre in Glasgow, while at the Gyle Centre in Edinburgh, bosses predicted they could have as many as 60,000 visitors. Fiona Moriarty, the director of the Scottish Retail Consortium, said: "The feedback we've had over the last 24 hours is that there has been a strong surge in the number of shoppers. "And we expect that to continue tomorrow." Christmas Eve will see large supermarkets and high street stores able to trade for only a maximum of six hours in England and Wales - from 1300 to 1800 in Northern Ireland - because of Sunday trading restrictions. The restrictions do not extend to Scotland, where Sunday trading has been legal for many years. Some large supermarkets have defended their decision to let shoppers in early, insisting the extra "browsing time" on Christmas Eve has been introduced to help frantic shoppers rather then to squeeze cash out of them. But religious bodies have opposed the practice. A spokesman for The Church of England said: "It is the workers in the shops we are concerned about, especially on Christmas Eve. "The cost to family life and stability, the health of employees and the contribution of small retailers to the community cohesion outweigh any potential benefits." Matthew Knowles, from the Federation of Small Businesses, said: "The Sunday trading laws are the only advantage small retailers have left over the larger competitors." But a spokesman from Asda said they were giving shoppers a "helping hand". A Sainsbury spokesman said: "I think it is about trying to make it easier for our customers if they only have a limited time to shop." Latest figures from the customer counting organisation FootFall show shopper numbers between Monday and Thursday were 22.6% up on the similar period last week. Despite the steady increase, year-on-year footfall is still down nearly 11%, it said. FootFall spokeswoman Natasha Burton said online shopping had taken early festive trade away from the high street. Kevin Hawkins, director of the British Retail Consortium, agreed that high street trade had picked up over the past week.